Hours ago, IBM just made another update to IBM Connections Cloud. To start off, community managers and administrators have access to even more metrics. 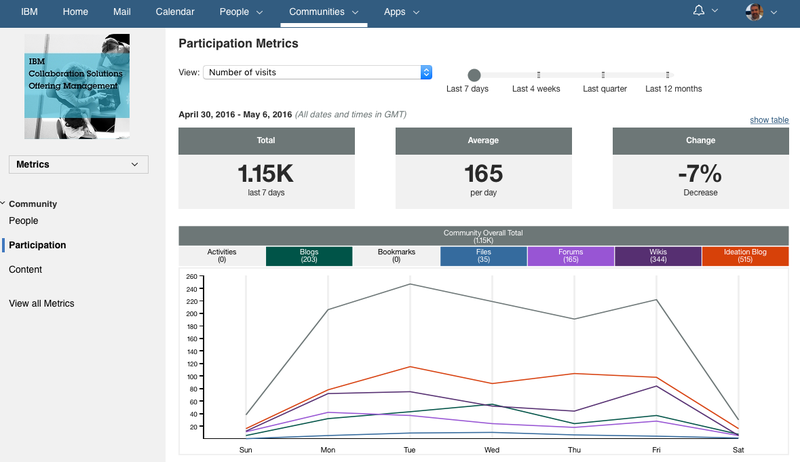 If you are an organization administrator, you can easily see how your user base is getting business value out of IBM Connections. For example, you can track Connections Cloud events such as every time that a user reads a blog entry, creates a To do item in an Activity, updates a wiki page, or follows a Community. You can drill down on one application or a particular time period. You can set filters to track how many people viewed a blog in the Customer Support Community in the last seven days, last four weeks, last quarter, or last 12 months. Community owners can also get metrics only on the communities that they own. Track who visits the community, information shared such as comments, and participation in such activities as downloading files. And there's more that was released if you are using IBM Verse. Check out the full list of what's new in IBM Connections Cloud. IBM Connections is ready to transform your organization, anywhere in the world. And since today is Monday, I figured I would leave you with this. If you still haven't seen IBM Connections, start your free trial here.